CRUNCH! Who doesn’t freaking love that sound? Well, maybe not when it’s the sound of my glasses as my foot descends on them, but I’m talking in my mouth! It’s one of my favorite eating sounds and sensations. I’m actually obsessed with crunchy food. CRUNCH! was also the theme of a potluck dinner I went to recently. Who suggested that theme? Oh, that was me. I wanted to get my crunchy friends. Needless to say, it was a fantastic dinner. Every dish had to have something crunchy about it. We had crunchy falafel with homemade pita bread, crunchy Taiwanese fried chicken, Thai larb salad with pork that has crunchy, toasted ground rice in it and many other crispy, crunchy treats. I made salmon potato latkes. I wondered what would happen if a potato pancake aka a latke and a salmon cake got married. This is a delicious spin on potato pancakes is perfect for Passover! I wanted it to be extra crunchy, so I added crisped rice to the coating. I was curious to see how this would work out and it did so “CRUNCH-i-liciously”! FillingPlace carrots in a small bowl with 1/2 teaspoon of kosher salt for 20 minutes, drain off excess water and pat dry. Place one half of the potatoes (1/2 pound) in a steamer basket and set in a small saucepan, over an inch of boiling water. Cover, and steam for about 10 minutes, until potatoes are tender but not mushy. Heat olive oil in a medium-sized skillet, over medium heat, add the onions and celery and cook until softened. Break up the salmon with a fork in a medium bowl. Mix in the cooked potatoes, celery-onion mixture, carrots and scallions. Add salt and pepper to taste. Mix in one egg. If mixture holds it’s shape, move on to next step. If not, add potato starch or flour, if needed, until mixture holds together. Form mixture into patties about 3” in diameter and 1” high and place on a plate. The patties should all be the same size. CrustSet up three bowls for breading the patties and a plate to put them on when they are breaded. Put potato starch or flour in one bowl. Make an egg wash by beating one egg with milk or water in another. Drain the remaining shredded potato, pat it dry with paper towels, then mix in 2 cups of the crisp rice, 1/2 teaspoon of salt and freshly ground pepper in the third. Bread salmon patties by dusting them evenly with potato starch or flour, then gently roll them in the egg wash to coat and press the potato-rice mixture to the patty adding more rice if needed. Place the latkes on the plate. Heat 1/2” of oil over medium heat, in a large skillet, to 375 degrees. Cover a plate with 3 layers of paper towels. Fry salmon potato latkes until light brown and drain on the paper towels. Be careful not to over crowd the skillet. Make sure the oil temperature is 375 degrees each time you fry a new batch of the latkes. Once all the latkes are all light brown, reheat oil to 375 degrees and re-fry them until golden brown. Serve with lemon slices and your favorite tartare sauce. I shredded the potatoes and carrots for this dish on a mandolin. Then, I cut the carrots lengthwise into approximately 1.5” lengths. You could also use the largest holes on a grater or a food processor fitted with a grater blade. This recipe is gluten free. You can substitute regular, all purpose flour for the potato starch or gluten free flour mix. I pre-cooked all the salmon potato latkes and refrigerated them. To reheat them: Preheat oven to 350°F. Put latkes on a sheet pan and cook for 15 minutes. 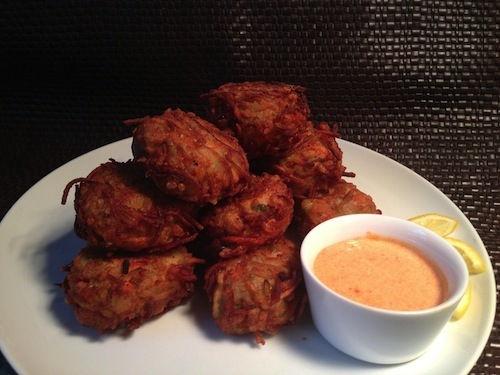 Learn how to make salmon potato latkes. I wondered what would happen if a potato pancake (aka a latke) and a salmon cake got married. I wanted it to be extra crunchy, so I added crisped rice to the coating. I was curious to see how this would work out and it did so “CRUNCH-i-liciously”!